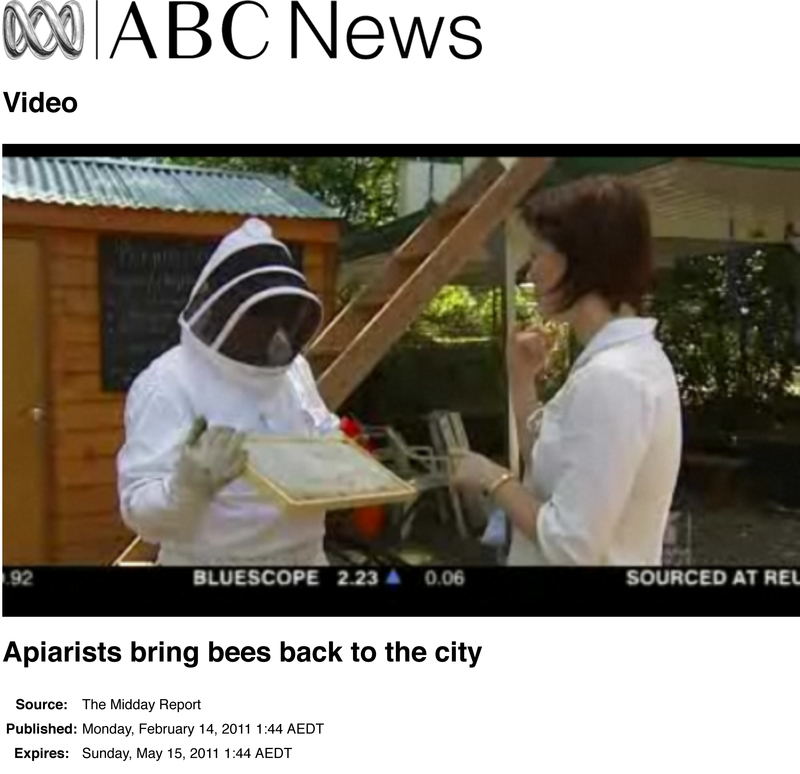 ABC News story - "Apiarists bring bees back to the city"
The timing is also a little uncanny as I am about to take delivery this evening of a beehive to go on my balcony! Stay tuned for more on that one (not sure if I'm really passionate or really mad... or perhaps a little of both)! This entry was posted in Beeswax Candles & Candle Making and tagged bees, beekeeping on February 18, 2011 by queenbcandles. 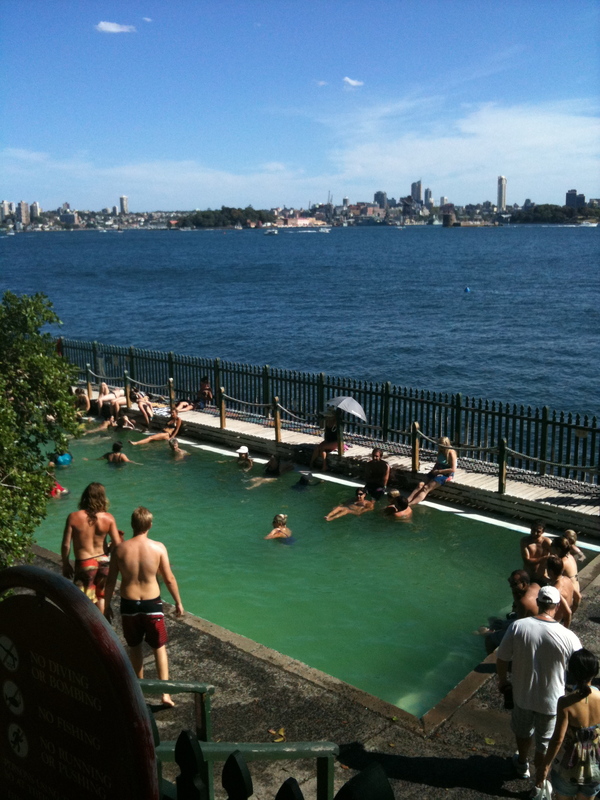 I would love there to be more beekeepers in Sydney, and more people knowledgeable and passionate about bees in Sydney. * Beehives grace the rooftops in New York (where classes sell out and the ban on keeping bees in the city was recently lifted), the veggie garden at The White House, they're in London (at Fortnum & Mason, The Royal Lancaster Hotel, actually all over London), not to mention in Paris at Paris Opera, and the Grand Palais on Paris' Champs Elysee. This blog also has great information and links. 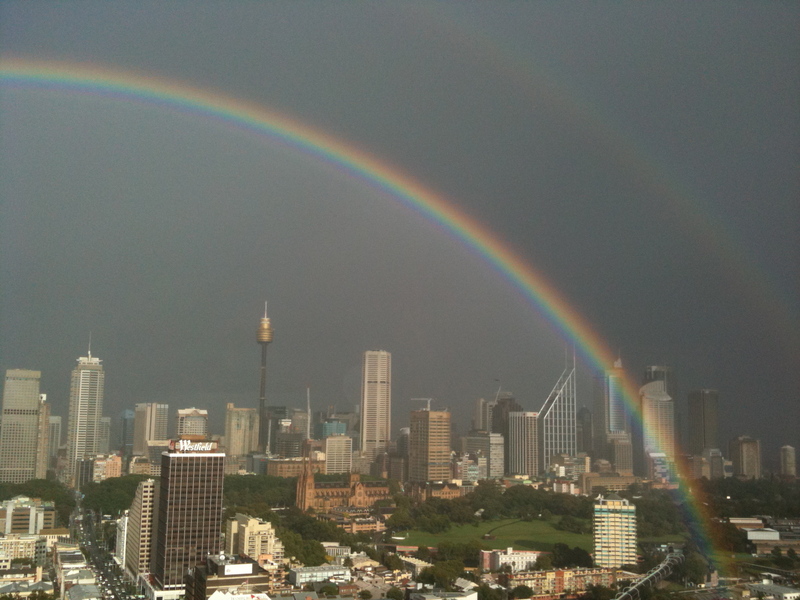 We need a bee renaissance in Sydney! Sign our petition and please help spread the word. 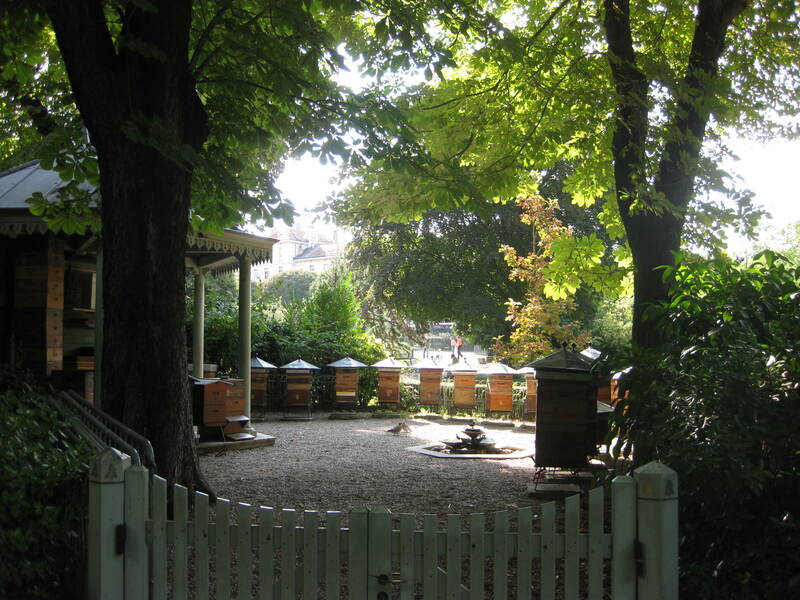 This dream was reignited recently when I was walking through the Botanic Gardens in Sydney for the first time in years, and was transported back to Luxembourg Gardens in Paris where I found the most fantastic apiary right there, in the sixth arrondissement of Paris, in the middle of the gardens. A few of my photographs are below. 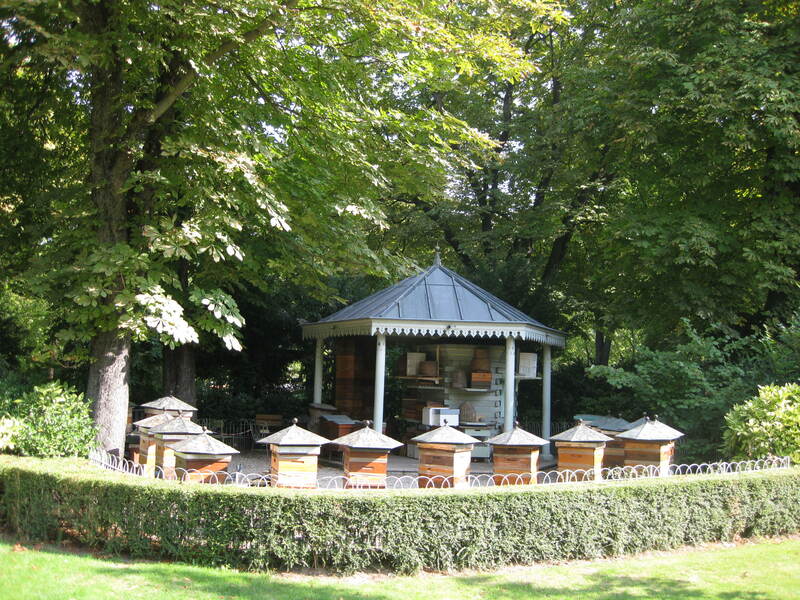 The garden had its 150th anniversary in 2006 and is looked after by Societe Centrale d'Apiculture. 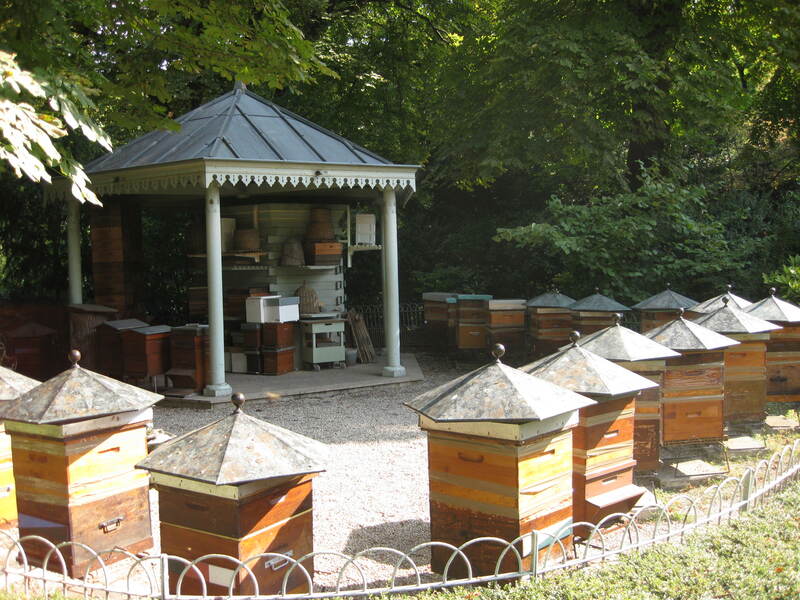 Each September they harvest they honey to sell in the Garden's Orangerie. To kick along the process of establishing a Bee Garden in Sydney, I am hoping to collect enough signatures to show the relevant authorities that this is wanted and important. Sign our petition to register your support or interest in urban beekeeping. * Note: this passion is not new, but it was reignited late last year when I read that Pittwater Council were spraying pesticides on the clover growing in the local parks lest kids accidentally step on a bee. Head shake. Eye roll. Yes, geniuses, far better to have kids running around on and breathing in pesticides than to have them wearing shoes in the park, or, God forbid, getting stung by a bee. Yes, a bee sting hurts. That does not mean you are having an anaphylactic reaction. There are far fewer people allergic to bee stings than peanuts. This entry was posted in Beeswax Candles & Candle Making and tagged bees, beekeeping on February 13, 2011 by queenbcandles. In 2010, there were 65 new posts, growing the total archive of this blog to 67 posts. There were 154 pictures uploaded, taking up a total of 161mb. That's about 3 pictures per week. So how fascinating is that? Out of all the revealing, heartfelt, witty, intelligent, insightful things (!!) that I wrote last year, the one that was viewed the most was about a thank you letter (sent to a customer who gave a gift of Queen B candles). Being someone who loves to analyse things (and wanting a full beehive complement of blog viewers in 2011! ), I pondered why? Is it that everyone loves a bit of good news? Do Queen B blog readers have a latent fear that they don't say thank you enough and want some tips?! - what would you like to see more or less of? - is doing a blog worthwhile, or should I reclaim my life and just focus on making beautiful beeswax candles? This entry was posted in Beeswax Candles & Candle Making and tagged giveaway, blogging, blog on February 13, 2011 by queenbcandles. 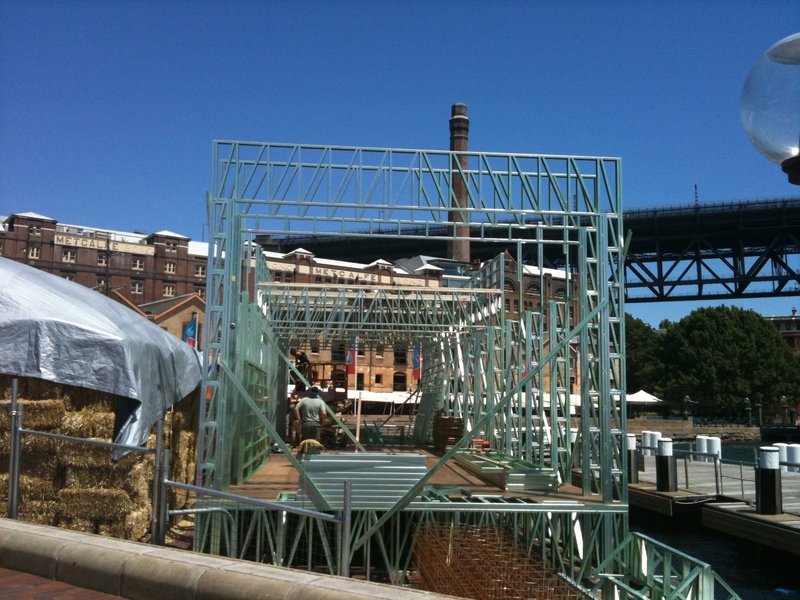 Melbourne wunderkind Joost has been sharing the love... with The Rocks in Sydney the first stop on the world tour of The Greenhouse by Joost. The building is insulated with locally sourced straw (from wheat, barley, rice etc) wedged into the frame - the framework being designed specifically to the length & width of strawbales. Interestingly, Joost was telling me the other day that in Germany, a timber framed house is fire rated to burn completely within 45 minutes, where a straw bale house is rated to burn in a day and a half. Amazing. New fact for that day. The light fittings are made from old fencing wire (and will be filled with a bespoke designed Queen B candle that we're working on at the moment). Even the flooring which was being (painstakingly) laid when I visited the other day is recycled... made from old conveyor belts! 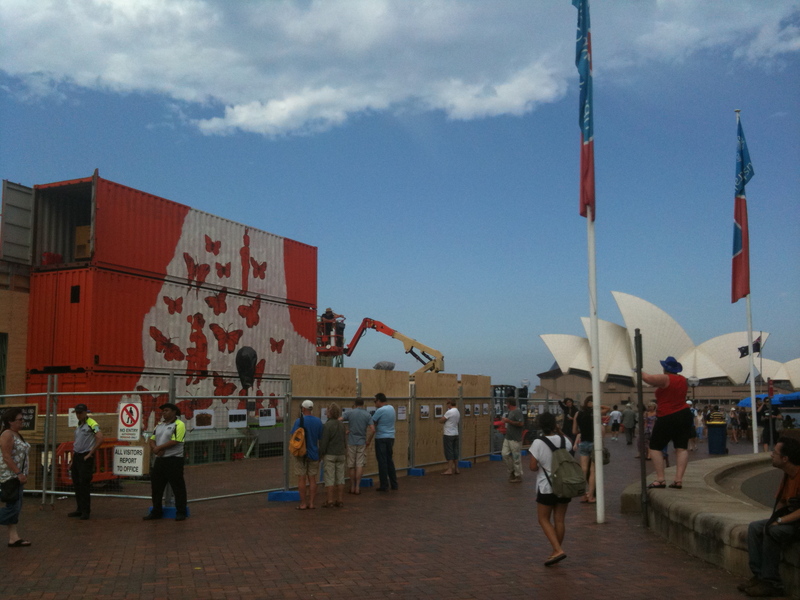 As if all those reasons weren't enough reasons to love having The Greenhouse in Sydney, I also love it because Sydney now has (temporarily) its very own 3-shipping-container-large David Bromley. It was really heartening to chat to Matt (Stone) today and I asked him how he was going in meeting the people he needed to meet and finding the suppliers he wanted... he said that it was under control thanks to Neil Perry who had taken him under his wing, introduced Matt to all of his own suppliers and made sure he had everything he needed. 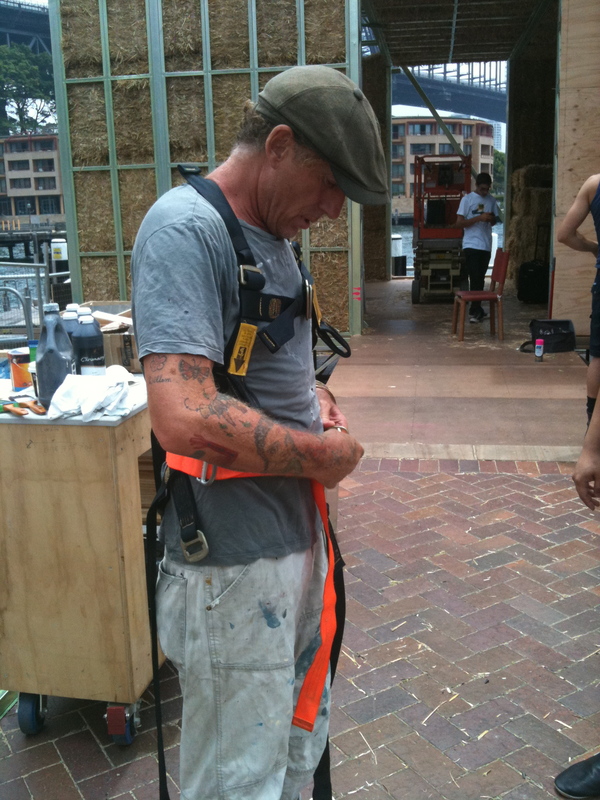 I knew that Neil was a fan & friend of Joost, but from Matt said this was serious going above and beyond kind of help. I'll sign off with an image of Joost himself sitting atop The Greenhouse (he had just bounded up the frame of the staircase in about 20 seconds, only to have to come back down again to find me gingerly trying to make my way up without falling through)! Whilst all of this may seem very "big business" (what an extraordinary building site), actually the Greenhouse is one big risky dream being undertaken by Joost and his wife Jennie. 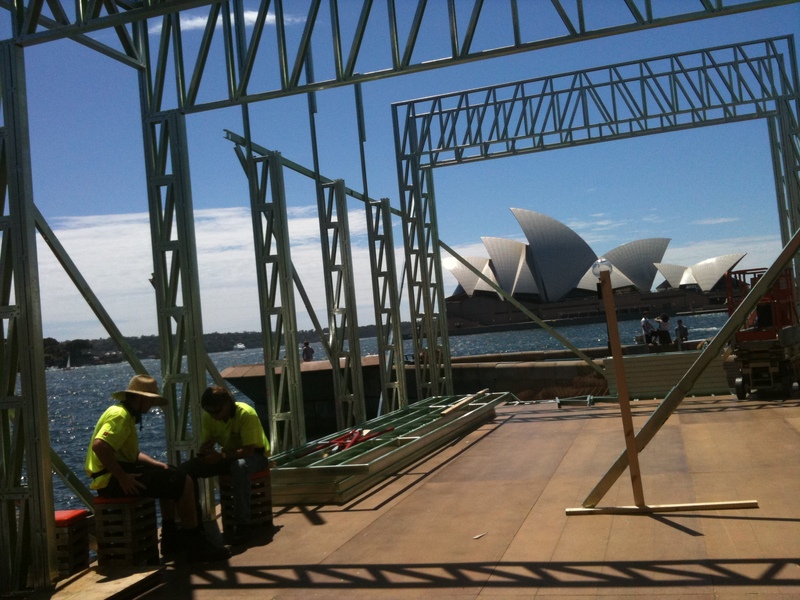 Yes, they have supporters - we need to thank Sydney Harbour Foreshore Authority for making this one happen - but, actually they have a lot of their own capital at risk with this project. Like most small businesses, they rely on fans to spread the word and support the cause. 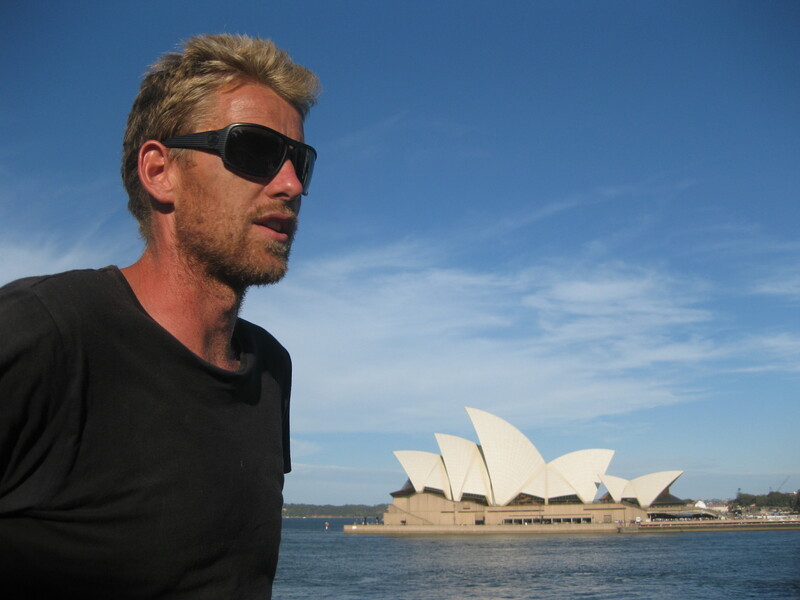 You can support Joost and the Greenhouse on Facebook and Twitter. 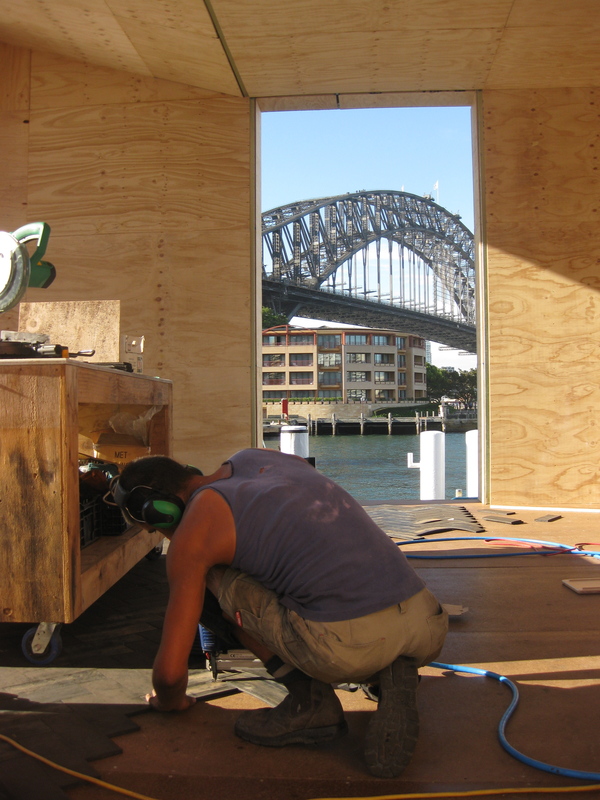 Better still, if you're in Sydney, why not pop by for a look, a drink and a meal (check the opening hours on their website). This entry was posted in Beeswax Candles & Candle Making and tagged Joost, Greenhouse by Joost, Collaborations on February 6, 2011 by queenbcandles. Nothing to do with beeswax candles! How extraordinarily lucky are we? 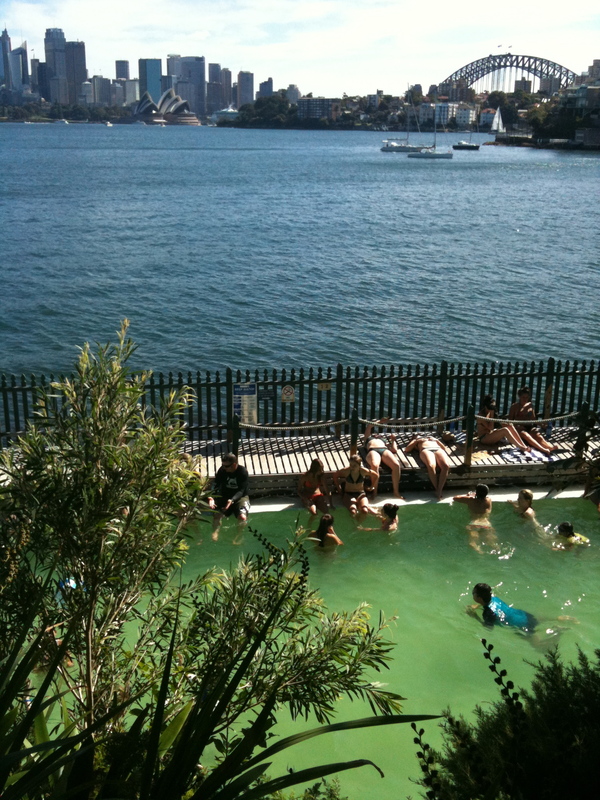 Where else in the world could you go for a dip at your local, free, harbourside pool with a view like this? This entry was posted in Beeswax Candles & Candle Making and tagged Random on February 6, 2011 by queenbcandles. We are often asked what to do with the left over beeswax from burning the rolled pillars. A lot of customers bring it in or send it back to us where we clean it and put it back into production (after all it is liquid gold). 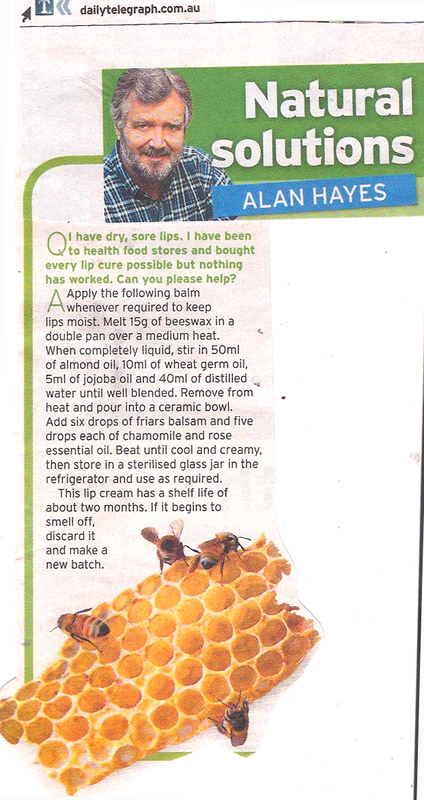 You may, however, prefer to use it yourself to make a beeswax lip balm. Melt beeswax in a double boiler over a medium heat. When it is completely molten stir in the rest of the ingredients. Remove from heat and pour into a ceramic bowl. Add six drops of friars balsam and five drops each of chamomile and rose essential oils (or pick your own favourites). Beat until cool and creamy, then store in a jar in the fridge, or keep in a small container in your handbag. This lip balm has a shelf life of around 2 months. If it starts to smell off, throw it away and make a new batch. Better still, make some for your family and friends. This entry was posted in Beeswax Candles & Candle Making and tagged projects, beeswax lip balm on February 4, 2011 by queenbcandles. We're in the middle of a bit of a heatwave in Sydney at the moment, and it's even hotter when you're working with molten beeswax. 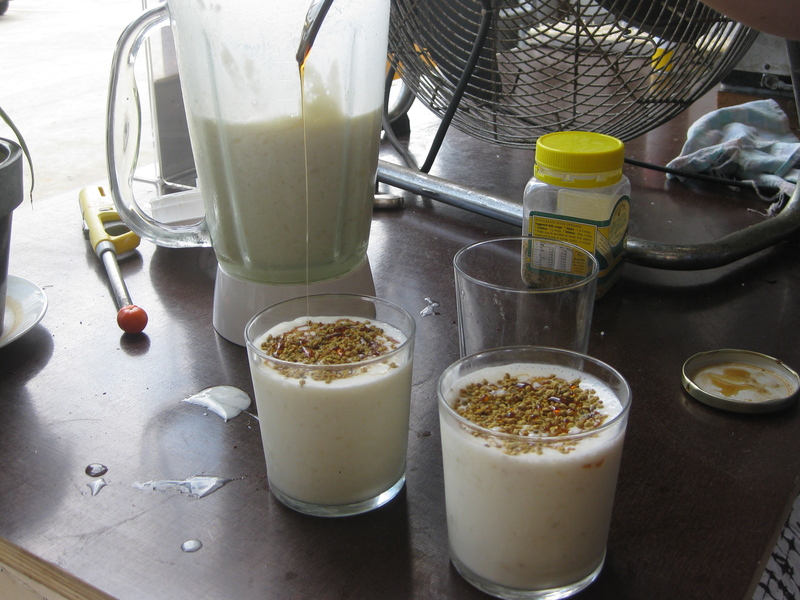 So, I've been making banana smoothies at the hive to keep the troopies watered, motivated and with a big potassium, vitamin B and protein injection (not to mention calcium)! Blend... lots! 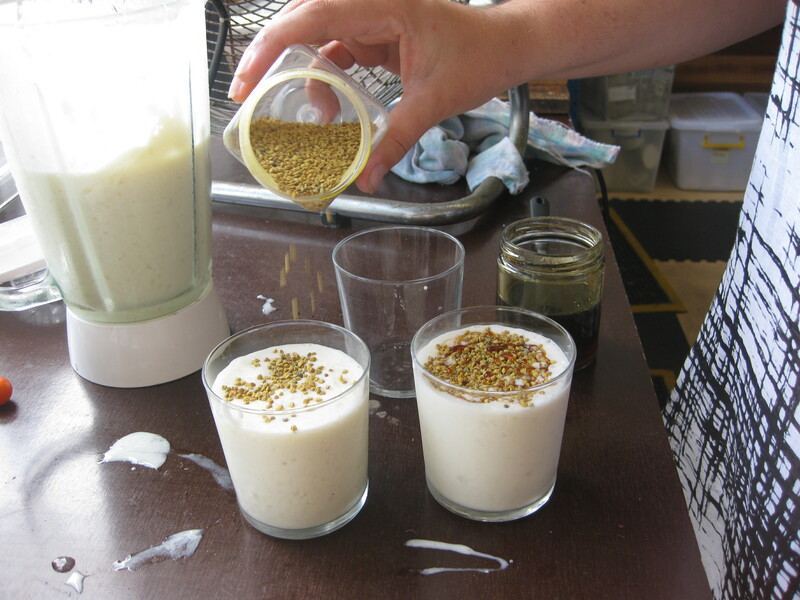 Sprinkle a little honey and bee pollen on top. You could also add spirulina if you like. Apologies for the dirty bench... we were all too excited to start drinking, so the photographs were a little secondary to the whole thing! This entry was posted in Beeswax Candles & Candle Making and tagged surviving the summer heat, honey recipe, happy worker bees, bee pollen on February 3, 2011 by queenbcandles. One of my epiphanies whilst I've been laid up was that I would like Queen B to have a more 'playful' energy. We've spent the past 8 years in survival mode. Trying to educate people as to why a pure Australian beeswax candle handmade in Australia would cost more. With so much blood (literally), sweat (yes, that's literal too) and tears (ah huh... lots!) invested in Queen B, I've developed a bad habit of taking it all too personally. Anyway, so, we're moving on from that energy. This year I'm channeling playfulness and abundance! Just as an aside, having made that (seemingly) monumental decision a couple of weeks ago, the universe decided to have a little fun with me last week. I would estimate that over 50% of the people who came into the hive looked at the candles (and even watched our talented worker bees pouring the candles individually from their enamel teapot), and then remarked on how expensive they were and walked out! [Just before you worry, no the prices haven't gone up... in years actually.] I reiterate.... channeling abundance... channeling abundance...!! Oh there's a lot to do this year. This entry was posted in Beeswax Candles & Candle Making and tagged Joost, Greenhouse by Joost, Abundance on February 3, 2011 by queenbcandles.